Home » Ask an Expert! » Harley Quinn and The Joker and Suicide Squad: Another Opinionated Opinion! Harley Quinn and The Joker and Suicide Squad: Another Opinionated Opinion! Written by: The Geek Girl Project on August 28, 2016. Guest Post by the amazing Tara Strand. Tara Strand is an actress, physical theatre performer, designer in general, and highly likely the first ever Harley Quinn cosplayer. Ah, Suicide Squad. You’ve already been up in our grills so much for so long, and yet we will surely continue to discuss and refer to you for years to come. And right now! 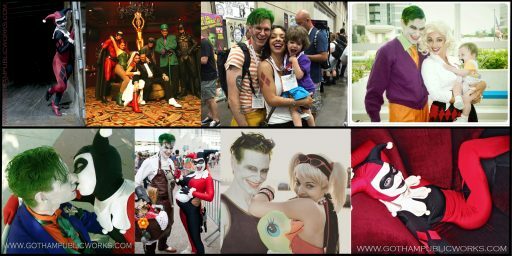 What follows is a fairly stream-of-consciousness look at Suicide Squad through the eyes of a long, long, really long-time, really opinionated Harley Quinn fan and cosplayer. Also someone who’s got no problem with Joker and Harley’s relationship as a work of fiction. Quite the opposite in fact. Speaking of, in an effort to save time and to keep from repeating the same things we all know about this fun mess of a film, I’ll be sticking to what really matters: Harley Quinn and The Joker, of course!! Yes. A thousand times, yes. As much as I enjoy that there’s a sweet, soft side to Harley, I feel that that gets given far too much weight in peoples’ minds about her. It’s why too many people feel so sorry for her (or who they see she was) and see her less as a villain and more as a victim; as this, poor, foolish, helpless character who needs saving from herself and who “deserves” better and who always needs to change for her own good because she’s better than her poor, pathetic circumstances, and who is only acceptable when she’s a Joker-hating Strong Independent Woman™, and so on… I really hate that. And if you’re looking for feminism, I don’t think that’s it. This Harley is the balance that I’ve always perceived. She is a bad guy! A villain! She is a twisted, vicious, dangerous psycho who has done horrible things and rarely feels that bad about it!! Yes, she’s disarming and fun and cute and delightful, and yes she has an ever-lingering piece of a sweet heart that she sometimes let’s out to play, but you DO NOT want to count on it. Her sweetness isn’t a rule, it’s part of why she’s a wild card! I think Robbie struck this balance perfectly, along with many other traits of Harley’s like her flirtatiousness, her loyalty once it’s earned, her carefully masked cunning, her playfulness and impulsiveness, her absolute strength and capability, her soft spot for romance, her friendliness and her willingness to deliver some tough love… even her fondness for grape soda! Oh, and best yet?!! Her disturbingly deep love for the Joker. Everything I’ve always believed Harley to be in the various measures I’ve believed her to be them, I saw it on that screen. There were lots of delightful moments that I sure won’t mind seeing again, and if this is the idea of who Harley is that the world at large gets introduced to, I’m grateful. Oh! But to take a moment to discuss that Alex Ross-style flashback? Yeah, that was a shame. I adore the sentiment behind it and that they cared enough to do it, but I would honestly bet good money that someone in there set out fully intending to make Harley’s original look look bad. Maybe I need to take a better gander at that scene, but the first impression that both myself and the fellow Harley cosplayer next to me got was of a really sloppily put together costume, and my personal pet peeve: the painted-on “mask”. When I listened to Kevin Smith’s Suicide Squad episode of Fatman on Batman where he remarks on how he guesses from seeing that moment that the original suit just really doesn’t work on film after all, all I could think was that he totally took the bait set out by the costumers or filmmakers or whoever to hopefully shut up all those Harley suit purists once and for all. Way to go! PS – And more use of the mallet vs the bat would’ve been nice. Just sayin’. It’s amazing what a little time and context can do. I’m not even sure how to describe the depth of distaste that shook me to my core when I first saw images of this guy. Every new, horrific detail compounded on the last. For months I couldn’t speak of it without taking a bracing sigh and about 5 seconds looking at nothing before I dared begin. But now… Ok, well, now it’s really not THAT much different! But his look suits the context and the gestalt that is their wacky Suicide Squad movie world, and as a designer I have to defer to that. And I appreciate that his silver teeth are kind of a nod to the fact that Joker’s always getting his teeth knocked out. But, oh, those goofily on-the-nose tattoos… And he just doesn’t have that devastating case of The Sexies that THE Joker does by far. To my tastes, anyway. Oh! Speaking of THE Joker (and this can help segue into the next bit), since Ledgjoker I’ve gradually opened up to what A Joker can be, and I’ve managed to separate the idea of A Joker from The Joker for myself. Both guys (Ledger and Leto) are A Joker and not The Joker. And they’re great! And I can say that without having to reconcile what The Joker is to me, which is a different thing than what they bring. This has been helpful to my sense of open-mindedness and keeping an emotional step or two back. Acceptable! And, again, context. Leto absolutely felt like A Joker (in a good way) and, I felt, did a great job of being the crazy and the scary rather than pointing to the crazy and the scary. The way his look does. I realized I kept subconsciously staring him down waiting for something to scoff at as far as a misstep in Mistah J-ness, and I didn’t really find it. I mean, aside from some of the writing of course, but that ain’t his fault. And a quick side note about BATMAN!!! I haven’t been as immersed in the Bat-U as I used to be, so whenever a new game comes out or a movie comes out (though I still have yet to see BvS) that features The Bat I’m always shocked about how I excited I get about BATMAN!!! I always forget how much I love seeing Batman until I see Batman. I felt that thrill when he popped up in SS, and it was very nice. Over the years I’ve written volume upon volume about this couple. Much of it’s lost to message boards and comments sections and my email drafts folder (though I dream one day of completing and sharing a more current write-up I’ve started), so for this I’m gonna try to reign in my kaleidoscope of thoughts about Joker & Harley and the way people see them and all that. A bit. But here’s the basic problem with the way basic people see them! (And please pardon the judgmental tone I’ll inevitably be striking.) While I fully recognize the abusive aspects of the relationship, I also recognize that it’s a side effect of who they are and always have been as characters. It is a secondary, or even tertiary, feature of what makes them who they are. To allow that to be what defines them, holding them to a mundane set of standards, is to miss the point ENTIRELY. In no way do I condone abuse in the non-fantasy world, but you need to be able to set aside those judgments and that common set of morals when engaging in a story about psychotic, narcissistic, murderous, fantastical clown people who live in a fictional world. It really shouldn’t be that hard. One thing stories allow us to do is to escape into a world that’s not constrained by our own, and to explore and have an outlet for unusual concepts that don’t fit into our everyday world. Disappointingly, there are a lot of people who have a lot of trouble making this distinction when it comes to Joker & Harley. The abusive aspects can be shocking and, thus, a lot of people get absolutely fixated on this feature. It becomes all that they’re able to see. And then writers and editors, having this same deficit in the realm of nuance and creative analysis, exacerbate this by writing stories that, then, also fixate on the abuse. Then rather than having an exploration into the fascinating and complex love between two nut-jobs we have another ham-fisted tale clarifying to us – as if we didn’t know – that the Joker can be mean. Wow, thanks for that novel observation. On top of that we have peoples’ sympathy for a Harley that they want to coddle and protect (see above), but probably the biggest problem in all this is so many peoples’ inability to even entertain the concept that the Joker loves her. I feel like it’s a huge part of why people feel so (unduly, in my opinion) sorry for Harley and want her away from him. And if I didn’t think Joker cared about her I’d probably feel the same way. In fact, I DID feel that way in the earliest bit of my Harley fandom. But then after not too long it became clearer to me that the Joker had immense affection for Harley. It was in all this subtext; all these little moments between the more shocking ones. Sometimes it was harder to recognize at first because we were seeing how THE JOKER loves someone. And it can’t be compared to the way anyone else shows love. It’s often selfish and resentful and mercurial and jealous and backwards and yet even sometimes just downright lovely, and it makes for absolutely fascinating fiction. And it made the Joker so much fresher and deeper for me on top if it. To see this whole new aspect to him and how he copes with such a disturbing new emotion! Sure, someone loving someone doesn’t excuse any amount of abuse one bit, but that’s us not wearing our Crazy Clown World glasses again. That he loves her is a far more interesting story for both characters – with more long-term possibilities – than that he doesn’t. If they still disgust you, fine, be that way. Agree to disagree. But I digress! So, anyway, I’ve long accepted that the Joker cares for Harley, and have seen ample evidence of it under the hands of skilled, thoughtful writers. Anyway, here’s where Suicide Squad fits in. Since a lot of people get too flummoxed by the Joker ever being *gasp! * mean to Harley to see anything else at all, the movie ends up putting most of that to the left so we can observe some of the other, more affectionate dynamics that have always been at play with the couple. I love those dynamics and I loved them in this film. Spot on. And it was so refreshing to enjoy them that way without getting scenes that I knew would be crudely interpreted by people who don’t get it, or a condescending sermon on how we ladies shouldn’t date abusive, murderous psychos. We got a story for those of us who see the other side, and we got a means for other people to hopefully consider that there even IS another side! I’m pretty excited by that. And they managed to do it while holding their relationship to its own crazy standards. It was still wrong and dark and twisted and creepy, and it was absolutely lovely. So much romance! I’ll keep this thing a little less crazy long by not pointing out the moment or three between them that could’ve been better executed or maybe left out altogether, but you can probably make guesses as to what those are. But anyway… Savor that delicious discomfort you feel while realizing you enjoy watching how Joker and Harley do love, people!! You’re on the right track. Various pictures stolen from Tara’s and Gotham Public Works’ Facebook pages! Fantastic to see Tara Strand used as a resource on this site, and on this topic – a wonderful choice. The ability she has for rationally separating Joker and Harley (in how she thinks of them) from how they appear in each film or comic is a rare thing. We were also excited to work with Tara on this!